“We should live with fantastic people, shouldn’t we?” Anna asks her husband. He agrees to try it out, and they interview a handful of prospective candidates. A few have more experience with intentional living than others, and offer to help outline house agreements. Nearly a dozen people move in altogether. It’s nice to see a movie that presents an intentional community so matter-of-factly, without sensationalizing the idea of community living. 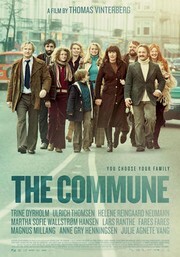 Mostly, the commune serves as a backdrop for Erik and Anna’s own marital issues, as they struggle to align their vision of their relationship with their newfound experimental lifestyle. After a while, Erik starts seeing another woman, and Anna suggest she move in too. Tensions arise, and Erik begins to assert “ownership” over the house that he agreed to share. It sounds like an interesting story! The movie opens in the U.K. this month and will be available on DVD in the fall. Check out the trailer and let us know if you get a chance to see it! Don’t want to wait until the fall? “Together,” a Swedish movie from 2000, also tells the story of an intentional community, and is available now on Netflix.